A hoist is a device used to lift or move material. It’s the tool that provides the muscle of your workstation, gantry, articulating jib, or overhead crane. 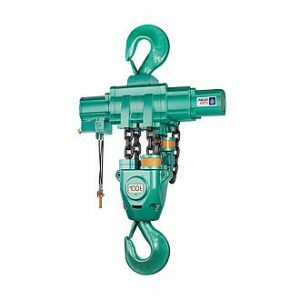 Of course, there are many different types of hoists – electro-hydraulic, manual or lever operated, base mounted, etc., these hoists are different in the way they move and how they are operated and powered, but the precautions for safe operations and an extended life span when working with them are the same. Your first priority is inspections. When should you inspect hoists? Inspect periodically as recommended by the manufacturer and follow maintenance procedures. As legislated. Some regions have legislated inspection times and procedures. Schedule inspections and have a log – having a plan ensures that it is followed and not forgotten. Replace items not operating properly. Tag defective items and remove from service for repair by trained personnel. Post the safe load limit on the hoist. Safe operation does more than protecting your workers, it also extends the life span of your hoist. Here are some pointers and tips to using your hoist safely and effectively. Know the safe load limit of the hoist. Do not exceed. Keep wire ropes and chains lubricated. This reduces drag and wear and tear on the chains. Hoist from directly over the load. If not centered, the load may swing when lifted. Hang hoists solidly in the highest part of the hook area. Rigged this way, the hook support is directly in line with the hook shank. Lever operated hoists can be used to pull in any direction, but a straight line pull must be maintained. Side pulling or lifting increases wear and sets up dangerous stress levels on hoist parts. Only one person should pull on hand, chain and lever hoists. Fast lifting movements create swing – always move loads in a controllable fashion. When loading the lower hook, place the load directly in line with the hook shank. Loaded this way, the load chain makes a straight line from hook shank to hook shank. Also, there’s a lot of situations where what you DON’T do is equally important for safety and maintenance. NEVER use hoisting equipment for lifting people. NEVER pass a load over workers. Do not tip a load. Unstable loads can harm the hook and hoist. Do not insert the point of the hook in a link of the chain. Do not hammer a sling into place. Do not leave slings dangling from the load hook. Place sling hooks on the sling ring when carrying slings to the load. Do not raise loads higher than necessary to clear objects. Do not exceed a hoist load limit. Do not leave suspended loads unattended. 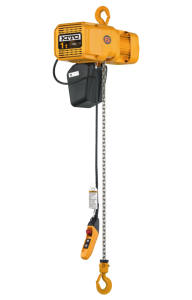 There are four main categories of hoists that you should be aware of, electric chain hoists, air powered hoists, manual hoists, and intelligent lifting devices (such as the one on the NEW Gorbel 660). Cryogenic Hoists – for deep cold operation (below -30c) these hoists have a pre-heating chamber to facilitate movement at the extreme end of the thermometer. Intelligent Lifting Hoists – Driven by a small computer, these augmented hoists are really in a class of their own. They detect and track the load to provide the lifting power that feels natural to the operator – like extensions of their own hands, for precise and ergonomic load handling. Whatever your needs in hoists, Acculift is there to support you. We provide service plans, installs, and delivery of many types of hoists and can source specific ones to fit your needs. Contact us today for a consultation or a demonstration.